Our stainless steel wire is manufactured to the highest standard from premium quality, marine grade AISI 316 stainless steel and suitable for all marine, commercial and architectural applications. 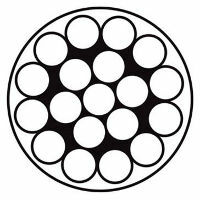 Each reel has full traceability and can be supplied with test certification on request. Dimensions and tensile grades, conform to the above international standard which stipulates tolerances on nominal diameter, minimum tensile strength and minimum breaking force for strands and finished wire ropes. Supplied in multiples of 125m. Cut lengths may be available subject to surcharge.